Kent peg tiles are the original and traditional tiles used on a variety of buildings in Kent and Sussex, with some dating as far back as the 13th century. Made from clay and brick earth, each tile is hung by two wooden pegs, and is smaller in size than standard peg tiles. With such history behind them, it is important to repair or replace each tile carefully. 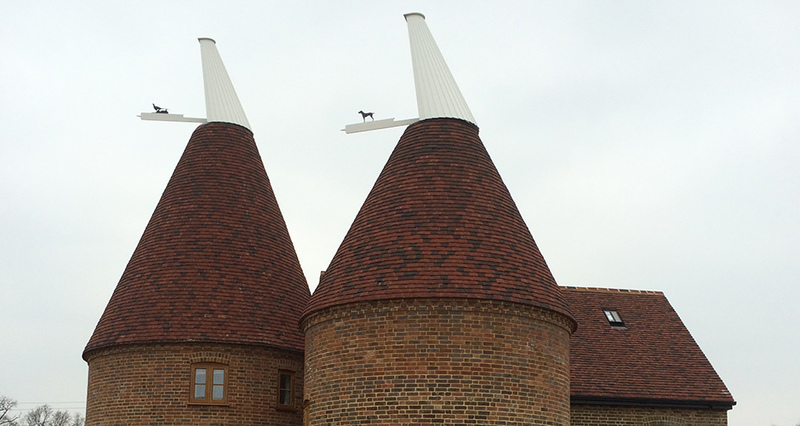 At Dude & Arnette we offer a repair and construction service, and can strip and replace your tiles, preserving the history of your Kent oast house. An original feature of many period buildings, we craft each tile individually using Kent clay, cutting every tile by hand, making each one unique – a distinct part of their popularity, and an aesthetic which can’t be replicated by mass production methods. We can also sell Kent peg tiles separately if required. As specialists in both Oast cowl construction and repair we also offer the following services; blacking kilns, repairing GRP flat roofs and valleys. For any questions about our services or your requirement details, please get in touch today and we can arrange a free consultation and quotation at a time that suits you. Call us on 01622 725 898, or visit our Contact Us page for more details.